Your Springfield Dentist Can Help You Smile Again! When you live with crooked or misaligned teeth, it’s always on your mind. It actually keeps some patients from smiling freely, and greatly reduces their confidence. You may have considered straightening your teeth, but the idea of wearing metal braces doesn’t excite you. Well, the good news is that there are other options and your Springfield dentist can help you smile again! At Olson Family Dental, we offer the innovative Clear Correct system, which are invisible braces in Springfield. Clear Correct utilizes clear plastic aligners to straighten your teeth instead of the metal brackets and wires of traditional orthodontics. The aligners are snug fitting and comfortable to wear and the fact that they’re clear makes them virtually invisible. You’ll need to wear them 20-22 hours per day and change them every two weeks. Most Clear Correct cases can be completed in 12-18 months, making them the perfect option for busy adults or teens that want to align their smiles discreetly. Besides being virtually invisible, Clear Correct aligners are also easily removable. This means you’ll be able to maintain your regular home care routine, as you’ll be able to brush and floss normally. It also means that there are no restrictions to your diet since you can remove them for eating. Aligners are comfortable and easy to wear, so they don’t interfere with your daily activities. 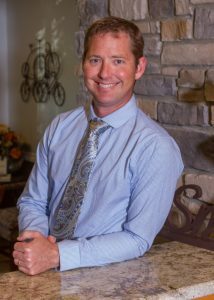 Dr. Scott Olson can determine if Clear Correct is the right treatment for you with an examination and x-rays. If you move forward, your treatment plan is created using 3D technology, so you’ll be able to see what your smile will look like prior to treatment. Another effective way to give your smile a boost is by whitening your teeth. We offer two convenient options for updating your smile with whitening. Our in-office system allows patients to achieve immediate results in one short appointment with us, while take-home trays give you the freedom to whiten whenever you like at home. Dr. Olson can help you determine which type of whitening will work best for your needs and lifestyle. Whitening may be a treatment to consider after straightening your teeth with Clear Correct, giving you the ultimate dazzling smile you’ve always dreamed of. If you’ve struggled with crooked teeth, don’t let your smile hold you back any longer. Contact our office today to learn how we can help you straighten and enhance your smile. Comments Off on Your Springfield Dentist Can Help You Smile Again!